Every wonder why you feel SO much better after Bikram? The practice feels so powerful…and mysterious…that senior teacher Chris Fluck describes it as ‘alchemy’. Here, a pain specialist, Dr Giresh Kanji, carefully explains the causes of–and cures for–modern-day anxiety and pain. He describes Bikram yoga to a T.
Many thanks to fellow teacher and yogi Lucas Miles for bringing this article to our attention. Adrenaline is a “fight or flight” hormone, and plays a central role in the short-term stress reaction. It is designed to protect individuals against threatening situations or in emergencies. In evolutionary terms this hormone helped the survival of the fittest animals. Prior to modern civilization human beings were busy hunting for food and avoiding being eaten by predators. When faced with a tiger the release of adrenaline helps the body to cope with the physical demands of fighting the tiger or running from the tiger. The intense physical act of running away or fighting burned up the extra adrenaline produced and stopped the effects of adrenaline on the body. As humans have become city dwellers the need to run from threat or hunt for food is decreased. In modern society pain, psychological stress, viral illness, alcohol, caffeine, bad memories and perceived threat release adrenaline. The release of adrenaline can also be subconscious due to memories. Bad experiences (post traumatic stress disorder) can lead to release of adrenaline without conscious control. When people are dreaming or having nightmares adrenaline can be released. The significant problem with releasing adrenaline for pain or stress is that the body cannot “fight or take flight” from these conditions as they are internal. Adrenaline is not burnt up and sensitizes the body and brain to cause significant distress. Adrenaline exerts its effect on the body by attaching to adrenaline receptors throughout the body. Often medications target these receptors including headache medications and blood pressure medications. The force of contraction and heart rate increase. Blood pressure is raised. Palpitations or awareness of heart beat may result. Suppression of stomach and intestinal action. Digestion is not important to fight or run so is suppressed. Blood flow changes to increase blood to muscles and the brain to enhance the fight flight response. The skin blood flow decreases and may result in cold hands, cold feet and increased hair loss as scalp blood flow decreases. Glucose and fats are released into the blood stream ready to provide for the increased physical effort that may be required during the fight/flight response. The release of glucose in the blood stream can aggravate diabetes. The release of fats, glucose into the blood stream as well as a raised blood pressure can all contribute to the risk of heart disease. Increased alertness results from sympathetic activation. If faced with a threat such as a tiger then being alert is beneficial to fight or run. If there is no tiger or physical threat increased alertness and anxiety leads to disturbed sleep as the body is alert to deal with a perceived threat. It is as though one is sleeping with a tiger in the bed. Ongoing anxiety can lead to lowered mood (depression). The hypothalamus (a centre in the brain) sends nerve impulses to the spinal cord that sends signals to the adrenal gland, a small gland that sits above the kidney. The sympathetic nerves weave through the adrenal gland and signal the release of adrenaline. Adrenaline is produced for vigorous physical activity to either run or fight. When running or fighting the adrenaline is used up. When the fight flight response is activated for pain, stress, flu illness or alcohol there is no vigorous physical activity that follows. The excess adrenaline then stays in the brain pathways and causes sensitization of adrenaline pathways in the brain. Normally nerves work in relays. At the relay (synapse) there are chemical messengers (adrenaline among others) that are released across the gap to activate the next nerve. 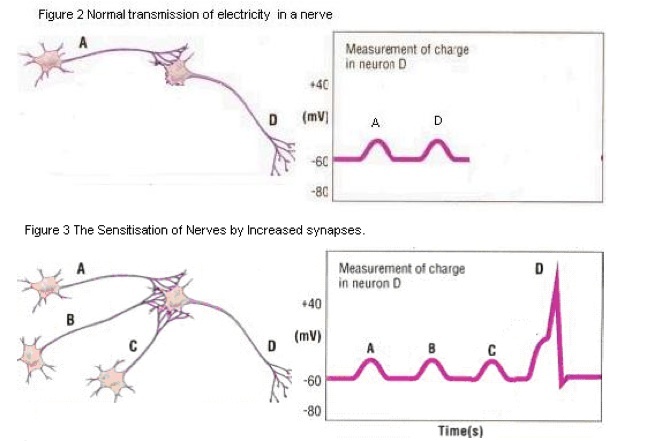 Figure two shows normal transmission with the electricity traveling in nerve D being similar to A. Figure 3 shows the effect of sensitization of nerves with increases in nerve synapses that allow increased adrenaline to cross the synapse and increase the electricity (increasing the strength of transmission) in nerve D.
Cortisol is a stress hormone released by the adrenal gland that has a daily variation, with the highest levels present in the early morning, and the lowest levels present around midnight (Figure 2). 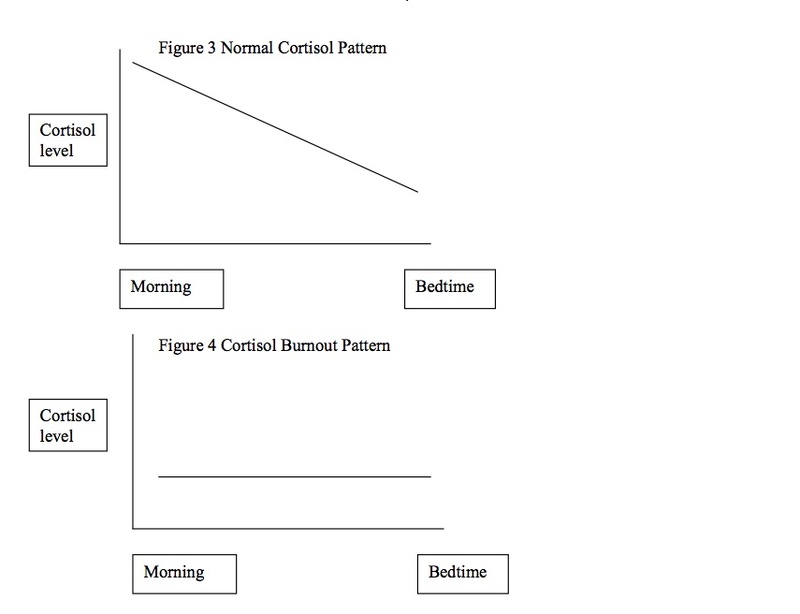 In conditions of long term stress, pain or infection the release of cortisol may burnout so the high levels in the morning are similar to the low levels at night (figure 3). Low levels of cortisol cause fatigue. After long periods of stress or chronic pain the low cortisol in the morning makes you feel tired like at night. 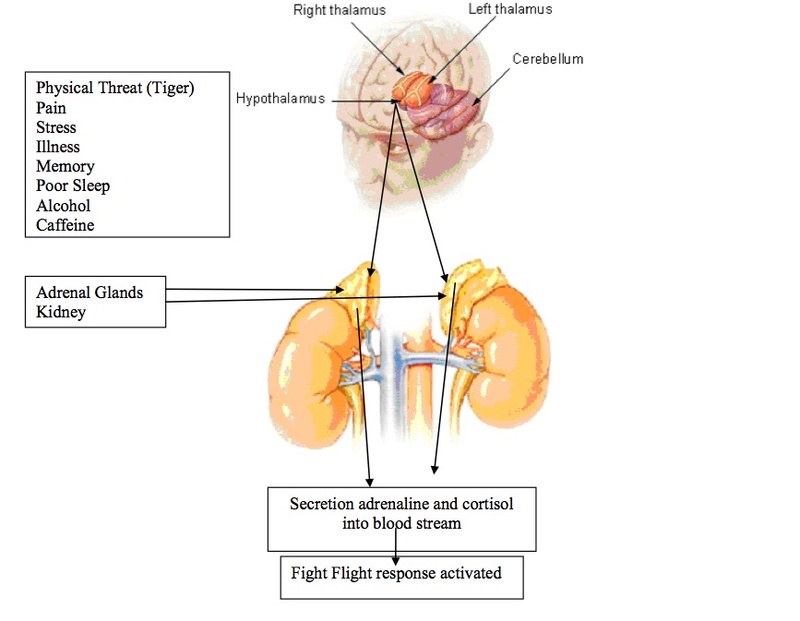 Cortisol also increases the body’s sensitivity to adrenaline and can aggravate symptoms of the fight flight response. The sympathetic nervous system arises from between the ribs at back of the rib cage and supplies all the blood vessels, sweat glands and the muscles that help hairs stand on end throughout the body. 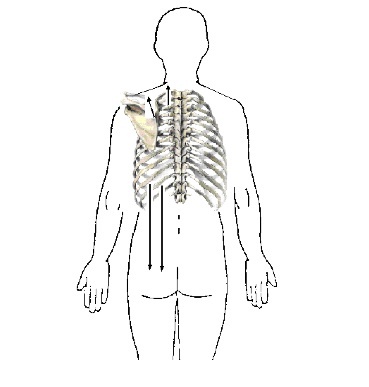 The sympathetic fibers from the first rib space generally pass up into the head, fibers from the second and their rib space into the neck, fibers from the third to the sixth into the chest, fibers from the seventh to eleventh into the abdomen and fibers from the last few spaces into the back and legs. There is however significant overlap in the segments. Treatment directed to the rib spaces helps chronic pain. Reducing adrenaline in the circulation will help the distress and insomnia patients suffer from chronic pain. Adrenaline can either be consumed or production can be reduced. 30 seconds intense exercise with rest periods of a few minutes may help burn adrenaline. While recreational walking helps with relaxation it is very unlikely to help decrease pain or help with significant anxiety symptoms. Sweating helps diminish the chemicals that produce adrenaline in the body. The deep relaxation felt after a sauna is likely to be linked to the depletion of adrenaline as well as other affects from the heat. Attending a sauna upto three times a week initially and then reducing to once a week after symptoms have subsided should be sufficient. A hot bath will produce the same effect but is less effective and required to be performed approximately five times per week. Initially for those not use to attending a sauna acclimatizsing slowly is recommended. After five to ten minutes leave the sauna, have a warm shower then reduce the temperature to cold. This will help stop any headaches due to the increased heat in the sauna causing vasodilatation of vessels. Meditation Deep relaxation or meditation is likely to reduce the production of adrenaline. In one large study 20 minutes meditation per day helped reduce headaches by 95%. Any relaxation therapy may help if performed 20 minutes daily. Meditation however seems to have the most evidence. Although there is evidence for meditation it is difficulty to perform as the brain is often irritable and will not keep still. The hot baths or saunas will decrease adrenaline sensitivity in the brain and body. Initially injections of anesthetic and saline have been performed over the past three years to learn the above information. However the treatment does not require injections although these are available for people if required. Once the adrenaline sensitivity is decreased then the muscle tender regions need to be treated. Figure 5 The sympathetic (adrenaline nerves) enter the spinal cord between the ribs. Dr Giresh Kanji (MbCHb, PGDip MusMed, FRNZCGP, PGDip BusInfo, FAFMM, MMgt) Musculoskeletal Pain Specialist Southern Cross Hospital 90 Hanson St, Newtown, Wellington. ← Open HOUSE. This SATURDAY.